Drinking too much has well-known personal costs—headaches, nausea, and regrettable 4 a.m. text messages. The Centers for Disease Control has put a figure on how much it costs the American economy: $249 billion. That includes spending on health care as well as the economic toll of lost productivity, car crashes, crime, and deaths attributable to excessive alcohol consumption. The biggest economic drag from tipplers manifests in the workplace. Alcohol cost $77 billion in impaired productivity at work in 2010, according to the CDC’s breakdown published in the American Journal of Preventive Health. Adding in absenteeism and other factors, the total productivity toll from excess drinking approached $90 billion. That’s not counting losses from alcohol-related deaths. The CDC has previously estimated that one in 10 deaths of working-age Americans are caused by too much drinking. The total cost of excessive drinking to the economy is rising. The last time the CDC made a similar calculation, excess drinking was blamed for $224 billion in costs, estimated for 2006. The increase, about 2.7 percent annually from 2006 to 2010, outpaced inflation. 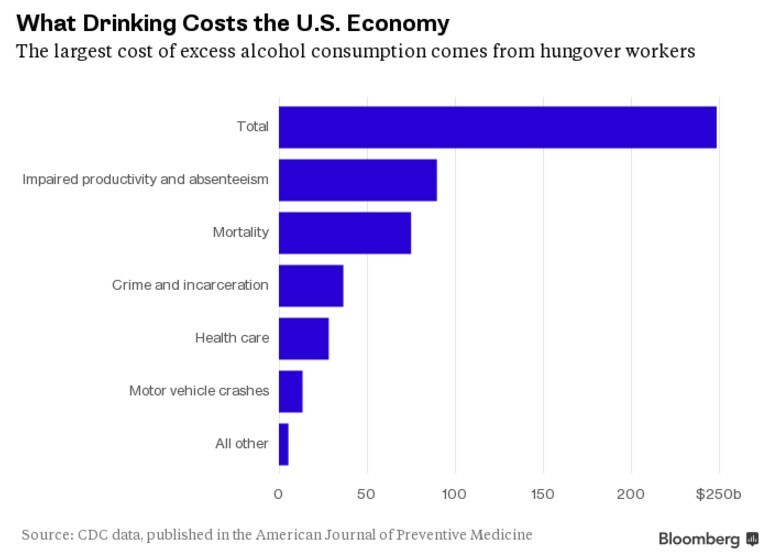 Most of the costs are attributable to binge drinking, and 40 percent of the total is borne by the government. Measuring such a big and abstract thing as economic damage from drinking is inherently imprecise. If anything, the CDC says its estimates lowball the true cost. It counted only factors in which alcohol was considered the primary cause, so illness or deaths from other causes that drinking may have exacerbated are left out. “Intangible costs like pain and suffering were not included,” the paper noted. So drink responsibly. The economy will thank you in the morning. Previous Previous post: Is Medicine Driving Doctors to Drink?